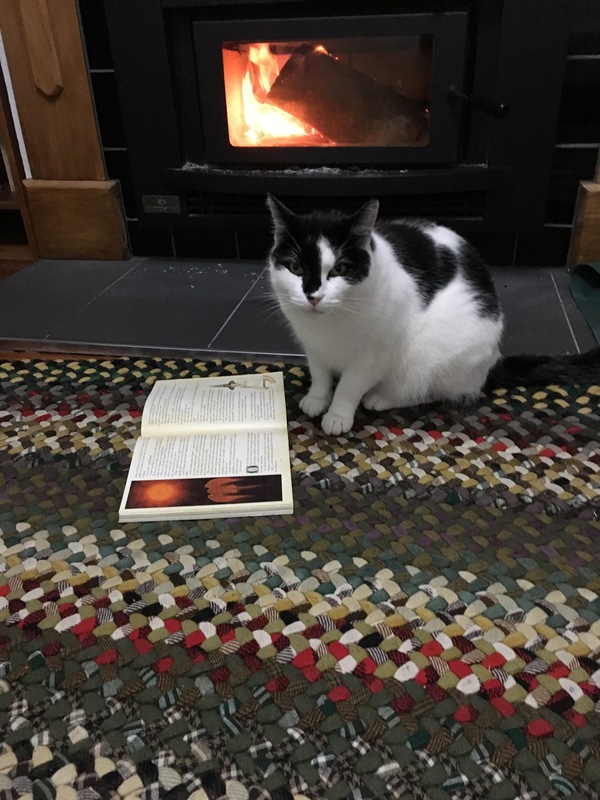 Cat enjoying a good book by the fire. I woke yesterday morning shivering under the summer quilt on the bed after a restless night listening to icy rain on the roof. Time to switch to winter mode, I suppose. I lit the first fire of the season. It wasn’t long before the cat joined me by the fire. Then my daughter, then my husband, then my son…Nothing like a hearth to draw everyone together. I think about the angst over today’s youth, separated from face-to-face interactions by their devices, and I think that perhaps what we all need are small, poorly insulated houses heated by inefficient wood burners. In a big, centrally heated house, it’s easy for everyone to retreat to their own rooms—shut the door, pull out the phone and troll the internet. But in our house, the only comfortable room in the winter is the 3×4 m living room. A teen who retreats to their room and shuts the door pretty quickly returns to warm up by the fire. Yes, we may all sit here doing our own thing, but by gathering around the fire together, we share what we’re doing with each other. Someone might share a good line from the book they’re reading, or show a dumb cat video they thought was funny, or ask for help on a maths problem. Simply by virtue of proximity, we connect in other ways. I will admit that on winter mornings, crawling out of a warm bed into the freezing air to light the fire, I dream of luxuries like heat pumps. And sometimes it would be really nice to have some space to myself, rather than do my knitting cheek-by-jowl with a teenager practicing a new juggling trick. But on the whole, I suspect the benefits outweigh the drawbacks. We humans are hardwired to sit around the fire talking to one another. Our ways of relating to one another, passing on wisdom and culture, and finding our place in a community evolved around the fire. So, again this winter, I will keep the home fires burning.